One of the biggest Martian dust storms on record is clearing up after nearly three months, raising hope that NASA´s stranded, solar-powered robotic vehicle, Opportunity, will soon come back to life. The US space agency´s 15-year-old rover was least heard from on June 10, when it went into "sleep" mode as dust blocked out the sun and darkness enveloped the Red Planet. 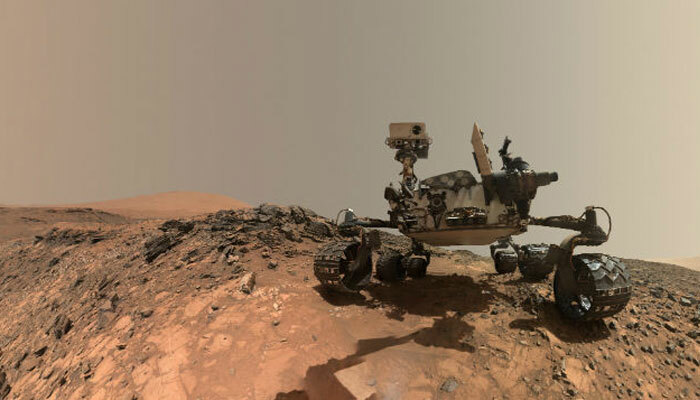 A NASA statement issued late Thursday called the situation "critical," but added that "the rover team is cautiously optimistic, knowing that Opportunity has overcome significant challenges during its 14-plus years on Mars." If no successful contact can be made, NASA says it will give up active efforts in mid-October. "If we do not hear back after 45 days, the team will be forced to conclude that the sun-blocking dust and the Martian cold have conspired to cause some type of fault from which the rover will more than likely not recover," said John Callas, Opportunity project manager at NASA´s Jet Propulsion Laboratory. "At that point, our active phase of reaching out to Opportunity will be at an end." However, "passive listening efforts will continue for several months," Callas said, because of the "unlikely chance that there is a large amount of dust sitting on the solar arrays that is blocking the Sun´s energy." Opportunity and its twin rover, Spirit, are a pair of unmanned robotic vehicles designed by NASA to tool around on the Martian surface and transmit data about conditions there, back to Earth. And even though it is hobbled, having lost the use of its front steering and 256-megabyte flash memory, not everyone is ready to give up so fast. The hashtags #SaveOppy and #WakeUpOppy have gained popularity on Twitter, with appeals to keep trying to contact the rover led by a former flight director and Earth-based rover driver for Opportunity, Mike Siebert. For Siebert, 45 days is too short, considering that NASA spent up to 15 months listening for contact from Spirit before giving up. "100% Grade A B.S. the amount of time given to recover Opportunity is woefully insufficient," he tweeted late Thursday. "Whomever made this decision is a coward."